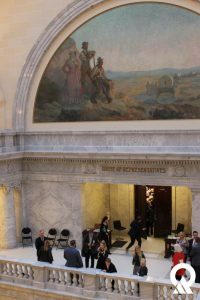 For the next 45 days, Utah’s Legislature will meet in Salt Lake City to pass new laws, fix old laws and enact a new budget. Today marks the start of another legislative session. For the next 45 days, Utah’s Legislature will meet in Salt Lake City. Elected officials will work together to change existing laws, pass new laws and set the state’s budget for the coming year. Some of these laws and appropriations will address environmental concerns. Although the Utah Department of Environmental Quality (DEQ) is a neutral player in the legislative process, our directors and scientists are available 24/7 to answer questions, provide credible, objective scientific information, and explain the impact that proposed legislation could have on Utah’s environment and its residents. After all, our mission is to safeguard and improve Utah’s air, land, and water through balanced regulation. One important part of each legislative session is the appropriations bill. This is how the state’s budget is created and enacted into law. Passing the appropriations bill is simple, but not easy. First, Governor Gary Herbert submits a proposed budget to the legislature. Then, the Legislative Appropriations Committees prepare their own recommendations. A final budget is drafted based on both recommendations. Then the budget is debated in the House of Representatives and the Senate. Through this process a final bill emerges. This is voted on. Once passed, it is sent back to the governor to be signed into law. For the coming year’s budget, here is an outline of four high-priority requests from DEQ. The Division of Water Quality is requesting $200,000 in ongoing money to fund the Harmful Algal Bloom (HAB) Response Program. The goal of the program is to protect public health, welfare, and businesses from the risks of HABs. The program will provide meaningful data and actionable information to responding agencies. The Division has identified 41 water bodies statewide that are at risk of HABs. These blooms pose a health risk to the public, including the release of liver toxins and/or neurotoxins and broad economic and ecological hardships for Utah citizens. The $200,000 provides funding for seasonal employees, equipment and supplies, laboratory services and funding to Local Health Departments, allowing them to make recreational advisory decisions and informing regulatory entities on decision-making regarding the safety of drinking water and secondary supplies. The Division of Water Quality is requesting $1 million in one-time money from the General Fund. This money will establish a competitive Water Quality Research Grant Fund to support studies in key areas. This is needed to fill gaps in our understanding of environmental issues, including standards development, storm water abatement and watershed protection, among others. Historically, the Water Quality Board has funded a number of similar projects through the Hardship Grant Fund. Increasing demand and limited funding from the Hardship Grant Fund is the driving force behind establishing a dedicated grant source for research projects. The Division of Drinking Water is requesting $150,000 in one-time money to use as a match for the Water Infrastructure Improvement for the Nation (WIIN) Act. This non-competitive grant provides $20 million nationally for Disadvantaged Communities. The money will be distributed to all states according to the EPA disbursement model. Utah, as a “1 percent” state is eligible to receive up to $200,000 if Utah provides 45 percent in matching funds. The $150,000 request will allow the state to receive additional money should other states not participate. DEQ anticipates that the grant money will set up an emergency fund for drinking water infrastructure failures caused by natural disasters or events such as wildfires, earthquakes, floods, or severe accidents. As we work through the legislative session, we invite you to participate with us. You can follow these and other bills at bill tracking webpage. We welcome your input and feedback. We hope to see you up on the hill as we present in committee meetings and testify on bills. As the Deputy Director over Policy, Planning and Operational Improvement, I enjoy working with legislators, stakeholders and our employees in finding ways to improve how we do our work. Prior to joining DEQ, I worked in the Governor’s Offices in Utah and Washington and with Deloitte Consulting in D.C., where I helped state and federal agencies identify and implement opportunities to improve. I earned my Bachelor’s Degree at Brigham Young University and my Masters in Public Administration (MPA) and JD degrees from Syracuse University. 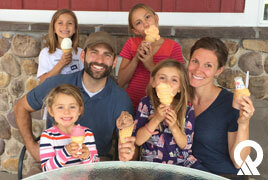 I LOVE to get outdoors and enjoy SKIING, running, hiking, backpacking, camping, working in the yard, fixing up our broken-down house, and anything else I can convince my wife and four daughters to do with me…oh yeah, and I really like ice cream!